I observed a special meeting of Cambridge City Council’s full council on Monday the 8th of November 2010. The meeting’s purpose was to consider the latest draft of the council’s Medium Term Strategy (3MB PDF) in light of the Government’s Comprehensive Spending Review the outcome of which was announced on the 20th of October. The spending review stated grants to councils will be cut by 28% over the 2011/12 to 2014/15 period. That’s an overall figure though, there’s no indication yet on how that will be distributed across councils, and on what grounds. Council officers reported there are: “some indications that core grant reductions may be ‘front loaded’” ie. implemented in the early years of the period. The council is a huge bureaucracy; even with spectre of 28% cuts, assuming the councillors get their priorities right, there’s no risk to core services like bin collections. Given the lack of detail available from the Government the meeting was rather without substance. The real meaningful discussions will come as various council committees debate and determine budgets in their own areas. Cllr Reid confirmed Cambridge City Council’s Council tax freeze is for one year only; this is despite central government funding the loss to the council from not imposing an increase for the next four years. (This is explained in the comments). Councillors complained the Comprehensive Spending Review didn’t include enough details of cuts to central government funding (which are expected to take effect in just a few months time) to allow them to plan to respond to them. In response to a public question from a representative of Cambridgeshire Older People’s Enterprise Cllr Reid, said she had no idea of what the effect of cuts on Shopmobility or Taxicards will be. Leader of the Labour opposition on the council, Cllr Herbert, said that our local Liberal Democrats have been left blindfolded by their own government as they still have no idea where the cuts will fall in 3-4 months time. Cllr Herbert made the insightful observation that the council tax freeze was centralisation not localism. A result of the council tax freeze is more of the city council’s funding coming from central government, and reducing the influence people have locally on the level of council tax. Newly elected Labour Councillor George Owers made his maiden speech at his first meeting (Some Lib Dems take many years before making a contribution). Cllr Owers said localism is way of making Labour councils take blame for cuts. He focused on the national political picture. Cllr Owers has published an article on his speech on his own website. He notes that most of the LibDems sat in silence looking bored throughout the meeting. Green Cllr Adam Pogonowski asked why council doesn’t put the millions it has in the bank to use to soften effect of govt cuts; and queried the very low interest rates the council is getting on its investments. There were tributes in many speeches to the work of Conservative Councillor Chris Howell, who had recently resigned from the council. Responding to a point Cllr Owers had made about tackling homelessness, Cllr Smart, the Liberal Democrat Executive Councillor for Housing said almost all of the “homeless” on streets of Cambridge actually have a hostel room to live in. Labour Cllrs Todd-Jones and Owers were the only councillors to focus on the potential effects of the cuts on homelessness, and housing. Labour Cllr Newbold called for an equalities impact assessment to determine if any particular sections of society would be affected disproportionally by the cuts to the city council’s budgets. Only independent Councillor John Hipkin attended a councillor briefing on the changes to the Medium Term Strategy led by the council’s head of finance. The vote on approving the strategy as 25 Liberal Democrats in favour; everyone else present abstaining. I tweeted the majority of those highlights live during the meeting. Labour Cllr Gail Marchant Daisley, who was away in the USA, followed the meeting via my tweets. Will new major tree planting schemes be subject to consultation, as required by S.9.1.2 of the council’s tree protocol? Prior to the meeting a committee manager sought advice from the council’s head of legal services; and following discussion with the Mayor and Council Leader disallowed my question. The reason I wanted to ask it is due to Executive Councillor Cantrill’s stubborn refusal to accept the council’s tree protocol covers new planting. I want to ensure new planting on Midsummer Common and Jesus Green goes ahead as quickly as possible and that the new planting proposals are included along with the fellings and other tree works which are about to be consulted on. I particularly think the proposed encroachment on the open space of Midsummer Common ought be specifically considered by councillors, particularly as significant elements were not included in the plans which were consulted on publicly. I was surprised by council officers’ working to determine if my question was in-order or not before the meeting. I assumed that the Mayor would have simply ruled the question out of order after I asked it if she didn’t think it appropriate. Had the mayor alone ruled I may have been permitted to ask my question. Cllr Todd-Jones was able, in reference to the section of the MTS titled: “Tree Risk Management”, to ask the Liberal Democrat ruling group if they would be able to “avoid the cuts on Alexandra Gardens”. No Liberal Democrats responded on that point. (Liberal Democrat Cllr Cantrill is considering destroying three, hundred year old, healthy, London plane trees on the green space there (more). Mr Boorman asked a number of questions on behalf of COPE. He wanted to know if the council tax freeze would be for one year only. Cllr Reid’s response was: “There will be a one year freeze”. Cllr Reid expanded on that saying: “The Government is providing four years of compensation, but we will offer one year”. She complained there was “no level of detail” in the Government’s announcements on what it would be requiring councils to do, and how it would be funding council tax freezes. (See the comments). Mr Boorman’s other questions were just met with “don’t knows” from the Liberal Democrats running the council. He asked if council tax benefit (council tax rebates) would be protected, and if the taxicard and shopmobility schemes would continue in their current formats. Mr Boorman also asked about housing benefit. Cllr Reid stated that the new cap on housing benefit – set at what I think is still an astronomical £25,000 per year, will have no effect at all in Cambridge. (£25,000 per year is enough to rent all but the three most expensive properties in the city currently being advertised to-rent on Rightmove.co.uk). 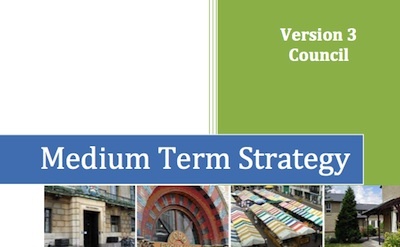 Cllr Reid’s introduction to the Medium Term Strategy was very brief. She appeared to suggest it was a document prepared by council officers and that she was merely reacting to it, just like the opposition councillors or any member of the public. The Liberal Democrats really don’t appear to have got the idea that they are in power, they have been given the job of running the city by its residents. Cllr Reid said the aim was to do the best possible for the council’s staff, tenants and residents. Cllr Reid said that as leader she had read the Medium Term Strategy “assiduously” this year; and admitted not having done so before as a councillor. Again this gave the impression it wasn’t a strategy she had set, but one she was merely introducing. Ex Council Leader, Liberal Democrat Ian Nimmo-Smith made a revealing comment in response to this from the daius, on which he sits in his position as Deputy Mayor. Cllr Nimmo-Smith said that he was able to read the strategy this year without the anxiety it had caused him in the past when he read it as leader. Those aged 60 and over, and some others, now get free travel under a Government scheme. Local councils where journeys start have to pay for these. As a centre to which lots of people come Cambridge has to pick up the bill for many people to get home again. The Council estimates that it faces a shortfall in funding of approximately £600,000 in 2010/11 as a result of the concessionary fares scheme. I think it is very disappointing that even with her party in government, and with a Liberal Democrat MP in Cambridge, the Liberal Democrat leader of the council feels she has no influence. I think this is a recurring theme we hear from Cllr Reid, and one. Public speakers at the previous council meeting strongly encouraged her, and her fellow councillors, to realise that they do have influence, that the residents of Cambridge have given them a mandate to speak on the city’s behalf to defend the city’s interests and that residents expect them to use that voice and not just complain about being powerless. Cllr Reid had previously told the council she regularly speaks with Julian Huppert MP; it now sounds as if this route of influence may not be in-place. 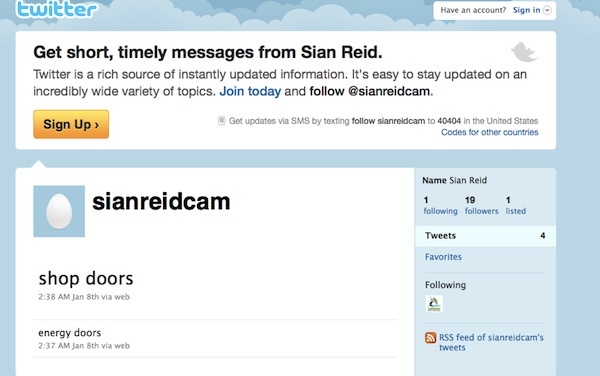 While @sianreidcam has been recently active on Twitter, following the new official CamCityCo account, there is no sign of any exchanges with @JulianHuppert. Cllr Neil McGovern, Executive Councillor for Customer Services and Resources, told the meeting that the council makes a quarter of its income from its cash and property investments. When I heard him say that I thought it was a fact worth checking. While it is slightly misleading of Cllr McGovern to include the poor return the council is currently getting on its substantial investments he is broadly right to say what he did. As a rough approximation one can reasonably say the council is funded 25% by the Council Tax, 25% by property investments, and 50% by a central government grant. In fact the council slightly more income from its commercial property investments than it raises through the council tax. This broad overview takes the reasonable view that council house related finances are separate, it doesn’t count housing rental income which goes into a ring-fenced account for spending on housing (from which the Government takes a cut to redistribute). “Income” the council gets through the council tax, but it then has to re-distribute to the County Council and police and fire services is also not counted as income. Investment income is forecast at £313k in 2010/11, potentially increasing to £559k dependent on interest rates. (That’s a slight underestimate of the costs involved as there’s capital repair and renewal costs for the vehicles and probably other related costs in other budgets too). This shows that while these cuts are large; there is a very long way to go before we need to start to worry about not being able to afford to empty the bins (assuming that’s the last thing to go). Councillors from all parties in Cambridge are calling for reform to the area used to set the maximum housing benefit which will be paid to new applicants in Cambridge. This isn’t affected by the overall national £25,000 cap, but by the fact the benefit levels are now set based on rents in a very wide area, well beyond the city and out into the fens, so the amounts available in Cambridge are being reduced. Those getting the benefit at the moment are not affected if they keep claiming it; but the effect of the change is that its now acting as a deterrent to people taking work as they are worried that they won’t be able to afford to stay in their homes should the job not work out and they need to re-apply for housing benefit. I think tweaks to the regulations to eliminate that trap ought be enacted urgently. One problem with the local housing allowance that was identified in the previous Parliament concerns the broad rental market areas. Many BRMAs are very large and cover very different areas. Cambridge is often cited as an example. The BRMA covers the city itself, a large rural area and some smaller towns, including Newmarket and Ely. Shelter’s research found that in Cambridge itself, only 4% of rental properties were affordable to people on LHA, while in rural areas up to 70% were affordable. That has significant implications for people on local housing allowance who want to access work. They are pushed out of the city, which is where most of the jobs, particularly the low-paid jobs, are to be found. That is not a new problem. It arose as soon as LHA was introduced. Mr Huppert sought to participate in the exchange, but his attempt was rejected on the grounds he had not been present in the chamber for the whole debate. City council has ‘no need’ to make savage cutbacks – Chris Havergal – Cambridge News. This entry was tagged Public Money. on November 10, 2010 by Richard Taylor. Andrew Bower has responded by Twitter to note that the funding for one year of a council tax freeze has to continue beyond the year of the freeze as there is a knock-on effect (unless when the freeze finishes the council ramps the council tax up to the level it would have reached had the previously planned annual rise(s) taken place) . 1.8	The SR announcement confirms that £700m has been provided to fund support to local authorities which freeze their 2011/12 Council Tax at the 2010/11 level. 1.9	For the City Council, this grant will amount to £170,000 per annum through to 2014/15. There is no indication or guarantee of funding to support the freeze beyond 2014/15 although the impact of this loss of revenue will continue. The Spending Review does not include funding for any further freeze in Council Tax levels beyond 2011/12. I suspect that is the kind of explanation Mr Cope was seeking. The impact of freezing Council tax in 2011/12 at the current level (in place of the forecast 3.5% increase) would be a reduction in income of £239,270 form that anticipated in the BSR. Was the representative of Cambridge Older People’s Enterprise (COPE) really called Mr Cope? Lib Dems aren’t the party in power, they are a minority partner in a coalition. We might have a Lib Dem MP, but he is a new MP, without the power and connections that his predecessor had. There is also no indication that just because they are the same party they will agree on anything. I personally think there is no reason over 60′s to get free bus passes. Kevin, I don’t think our MP’s influence is any less because he is new to the role. Whoever Cambridge residents elect to represent has influence deriving from that electoral mandate which far far outweighs any influence derived from who they know. The question isn’t the central government policy on free travel. It’s on who pays and on ensuring Cambridge is not hit disproportionately. I too think universal free travel for all over sixties paid for by taxpayers is questionable. Many older people are very wealthy and don’t need the handouts.